Can You Use an Electric Toothbrush with Braces? The New York Times reported that the number of adult braces had gone up by 58% from 1994 – 2010. Adult braces used to be uncommon. Not anymore. In fact, one in every five people seeking braces treatment in the UK is an adult. Lots of adults and children are getting braces to correct overbite, underbite, crossbite, or crooked teeth these days. Maybe you’re an adult who is wearing braces. Or, you have a child, niece or nephew who is wearing braces. And you want to know if you or the child can use an electric toothbrush with braces. This article is for you. So, let’s go straight to the question: Can you use an electric toothbrush with braces? The answer to that question is a big “YES.” You can use an electric toothbrush while undergoing orthodontic treatment. Braces can transform your smile. They can give you a beautiful smile that can enhance your face. A beautiful smile can give you confidence. But as you wear braces, there’s a need to clean your teeth and do it well. Food particles can easily become stuck under those braces. Those particles can turn into plaque that could cause serious gum disease and teeth problems. So, you need the right toothbrush. Why should you use an electric toothbrush with braces? What are the risks of using an electric toothbrush with braces? 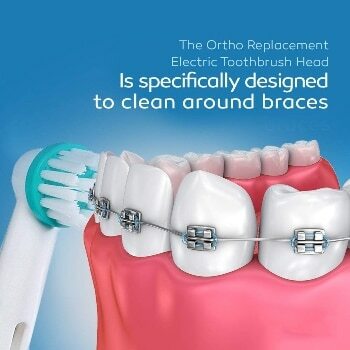 An electric toothbrush is better than a manual toothbrush for anyone undergoing orthodontic treatment. When I tell people that wear braces that an electric toothbrush is a perfect option, they often want to know why I said that. I can understand their reason for wanting to know why I’ll rather buy an electric toothbrush when I’m wearing braces than a manual one. Electric toothbrushes are more expensive than their manual counterparts. Of course, if people are going to be buying a product that’s more expensive, they should have a strong reason for that. Good oral hygiene is a big challenge for most people wearing braces today. Brushing your teeth when you wear braces is more difficult. It can be painful sometimes. Foods can easily get trapped under those wires. It’s hard to remove them with a manual toothbrush. Electric toothbrushes work faster and are more powerful. They can get anything between those wires out as fast as possible. Electric toothbrushes clean the teeth better than the manual one. And if you’re wearing braces, you need a toothbrush that’ll give you 100% protection against gum disease and tooth decay when you wear braces. You can only get that from electric toothbrushes. You deserve to have a beautiful healthy smile at the end of your orthodontic treatment. To guarantee that, you need to buy an electric toothbrush. An electric toothbrush gives you deep cleaning than a manual toothbrush. You need deep cleaning when you’re wearing braces. You need a toothbrush they can reach every corner of your teeth and mouth. A good electric toothbrush will tell you the important parts of the mouth the toothbrush hasn’t reached. There’s no way a manual toothbrush will offer you that. Multiple studies have shown that electric toothbrush is more effective for plaque removal and prevention of gum disease. When you’re wearing braces, you want to ensure that your gum and teeth are 100% healthy by the time your treatment is completed. Bad gum or teeth health means that you’ll only continue to deal with another problem after you’d stopped wearing braces. But, you can avoid that when you choose to buy an electric toothbrush for your braces. Because electric toothbrush gives you better and deeper clean, I don’t see the reason why you can’t use them with braces. Let’s assume that you’ve decided that it’s best you buy an electric toothbrush to use with your braces. That would be good for your oral health. But you can’t just buy any electric toothbrush you see. There are some important things you need to consider before you choose an electric toothbrush brand. There’s are lots of electric toothbrush brands out there that claim they sell the best toothbrush. Some of them aren’t that effective for people with braces. After reading the factors you’ll learn about below, you’ll know if an electric toothbrush is good for braces, or not. A good electric toothbrush should be easy to use and hold. If the toothbrush isn’t easy to use, then it’s not good for braces. It takes some time to get used to brushing, talking and even drinking with braces. Your toothbrush should make life easier for you. Not harder. The simplicity of the toothbrush is something I pay serious attention before buying it. There shouldn’t be numerous button controls on the toothbrush. I shouldn’t require an engineering degree to know how it works. Even children who wear braces should be able to use it without much effort and explanation. Great electric toothbrush comes with some helpful features you’ll never find in regular brushes. A 2-minute timer and a 30-second break are a must have feature in most electric toothbrushes. An electric toothbrush that doesn’t come with this feature is a fake and not good for braces. Most high-quality electric toothbrushes also have the Bluetooth technology built in them that allows them to communicate with a smartphone app their users can log into and learn about their brushing habits. More features in an electric toothbrush don’t necessarily mean that it’s good. You only need the vital features that are important to you for the purpose of cleaning your braces well. A great product should run smooth and be consistent. If the toothbrush stops working most times suddenly, it’s a sign that it doesn’t have good performance. You need a toothbrush that works amazingly fine if you want to remove food particles between your teeth and braces. The toothbrush should clean fast and reach any tight places between your braces. Make sure you check what people are saying about an electric toothbrush before you buy it. Does the toothbrush offer good performance? If it doesn’t, then it’s not the perfect toothbrush for your braces. Durability is an important factor to consider when buying an electric toothbrush for braces. For example, if the brush heads can withstand much pressure, it means that it’s not the ideal toothbrush you should buy. Braces are wires. Not all brush heads are good for braces. I’ve seen some bristles got pull out and stayed stuck between the braces. That indicates to me the toothbrush isn’t good for braces. A good toothbrush for braces should be able to last for over a year. If a toothbrush is wearing out or constantly losing some key components, it shows that it isn’t the right one to continue cleaning your teeth with. Great electric toothbrushes come with different brushing settings to choose from. You should be able to select the setting that’s comfortable for you. For example, people with sensitive teeth would want to choose the sensitive brushing setting. And people who want to clean their tongue with their electric toothbrush should be able to select a setting that lets them do that. Most importantly, an electric toothbrush should have a setting that lets you get deep clean. Deep clean is the perfect setting for people with braces. Design matters to me when selecting an electric toothbrush. A toothbrush that stands out on the bathroom’s counter will remind me to brush my teeth. When you are wearing braces, it’s important that you brush your teeth twice a day. You may not remember to brush in the evening for one reason or another. But when you have a toothbrush that calls your attention in the bathroom, it helps you brush regularly. Getting a toothbrush with great design was what helped me to turn twice daily brushing into a habit. The way you brush your teeth normally is different from how you brush when you’re wearing braces. Let me quickly explain the step by step process of brushing with an electric toothbrush when you’re wearing braces. Step 1: Rinse your mouth with water before you start brushing. Doing that will help you loosen food particles that are stuck to the braces and teeth before you even start brushing at all. Step 2: Run the brush under water for 20 seconds. Some food debris may have been stuck to your brush head since the last time you used it. The toothbrush too may have some bacteria in it. Running the bush under water remove bacteria and food particles on the brush. Step 3: Apply toothpaste to your brush. I prefer fluoride-based toothpaste. Fluoride toothpaste is the main ingredient that helps clean your teeth, gums, and braces. Step 4: Spend 2 minutes brushing your teeth. The mouth is broken into four parts, with each taking 30 seconds to complete. These four parts are upper right, upper left, lower left and lower right. Step 5: Place your toothbrush 45-degree angle to the gum line. This will allow you to clean the gums as you brush. Step 6: Brush the outer and inner surfaces of your teeth. Step 7: Brush in-between the braces. After brushing your teeth normally, you should also clear areas that are between the braces. Step 8: Rinse your mouth and toothbrush. When you follow the above eight steps, you’ll be able to brush your teeth well with an electri toothbrush. These eight steps are what you need to clean your teeth without braces. In order to address the safety concerns of my readers on this blog, I decided to research electric toothbrush and study deeply if there are any risks involved with using them. I reached out to lots of dentists. The ones I’ve known for years and the ones I don’t know at all. Most dentists said that electric toothbrushes are good for people with braces. There is no risk connected to using them. You can buy an electric toothbrush and start using it with your braces from day one. Above, I explained in simple eight steps, how to use an electric toothbrush. I’ve been using my electric toothbrush following those steps for years, and I’ve never heard or seen anything like that. So, there’s nothing to worry about. You can use an electric toothbrush starting today, even with your braces, if you want. I’ll say that an electric toothbrush is better than a manual toothbrush by over 1000%. When you buy an electric toothbrush for your braces, be sure that you’re buying a product that’s durable, has an attractive design and comes with different brushing settings. I wrote a review on the best electric toothbrush. I took my time to review these toothbrushes are the best. After many months of trying them, I can tell you electric toothbrushes are great for the skin. Make sure you get an electric toothbrush for braces today. How Can I clean my Electric Toothbrush? My name is Ryan Craig. I’m passionate about teeth and gums. I teach people how to improve their oral hygiene and buy the right oral care products.